I decided to move to The French Riviera on Tuesday June 28th and rented my apartment on Saturday July 2nd. I heard the words escaping from my mouth, felt my brain forming the sentences and pushing them through my lips, but it didn’t feel real. As someone who feels most comfortable with lots and lots of plans and back up plans and back up plans for the back up plans, this decision was quite a departure. After seven years working as a television news producer in Washington, DC, I had finally decided to jump. I had just returned from a stunning vacation with old friends to Israel where we celebrated a dear friend’s wedding, and sunned ourselves on the sultry beaches of Tel Aviv for 10 days. I had been back for less than a week and couldn’t stop looking at the golden happy pictures of us all on Facebook. 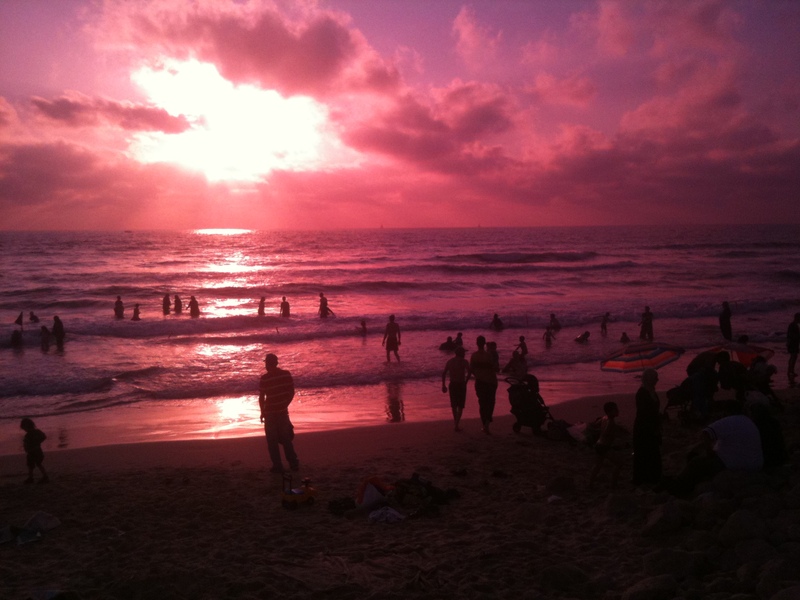 The beach in Jaffa at stunning sunset. I couldn’t pull myself back into the reality of my life in Washington. I realized I was dreading riding the elevator up to the 8th floor of my office building, and felt a growing repulsion to my ergonomic desk chair, my username, and my password. Another driving force behind this sudden decision, was my ex boyfriend… the last time we saw each other was at the airport in London, waving good bye after a final stay in his apartment in Nice nearly two years before. Things had become rocky after 4 years of long distance and after we broke up, he had moved to the Middle East to cover the West Bank and Gaza. Despite our problems, the flame had never really fizzled and we had decided to see each other again while I was in Tel Aviv for the wedding. It was his idea for me to move to France, live in his apartment, and learn French. He said he felt better knowing that even though I wasn’t in Ramallah with him, there was a direct flight from Tel Aviv to Nice everyday and we would be closer to each other. I had moved to Washington, DC my final semester of college at UC Santa Cruz. My dream was to work for NPR, so I signed up to be an intern at the local DC affiliate: WAMU, and once I completed all the credits I needed to graduate, I decided to stay on in the nation’s capital and try to get a job in broadcasting. Through random good luck, I landed an internship at the BBC’s Washington bureau, which turned into a few freelance shifts, and then permalance, and then after a few years a staff position. I was living the dream for a journalist. Working for one of the most well respected news organization on the planet, in a city where the stories never dry up. But after nearly a decade I was feeling desperate for a change. This had been my only professional experience, and at 28, I thought if I didn’t make a break now, I might never be able to. I saw my life stretching out in front of me, and wanted it to look different. This was my chance. So I drew up a huge daunting list of things to do, and started checking them off. I had 30 days to wrap up my adult life and ship it of to the Cote D’Azur.